The holy Hierarch Hilary was born of pagan parents in Gaul, and was trained in philosophy and rhetoric and a high level of Greek. 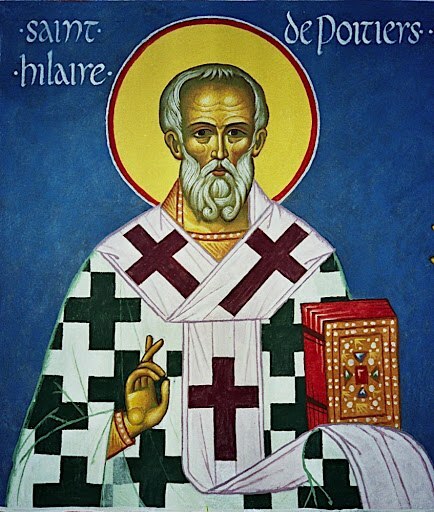 At a time when paganism was still strong in Gaul, Saint Hilary understood the falsehood of polytheism after studying the Old and New Testament writings, with the result that he abandoned his Neo-Platonism for Christianity, and with his wife and his daughter (traditionally named Saint Abra), was baptized and received into the Church. About the year 350 he was ordained Bishop of Poitiers, when Arles and Milan were in the hands of the Arians and the Arian Constantius was sole Emperor. Like his contemporary Saint Athanasius, Saint Hilary's episcopate was one long struggle against the Arians. 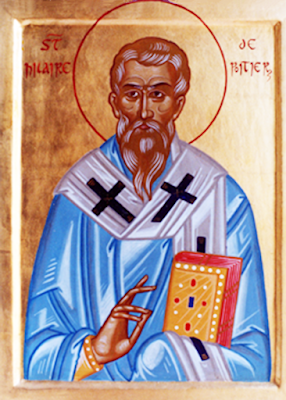 As Bishop of Poitiers, Saint Hilary foresaw the future greatness of Saint Martin (Nov. 12), and attached him to himself. In 355, when required to agree to the condemnation of Saint Athanasius passed by the Synod of Milan, Hilary wrote an epistle to Emperor Constantius convicting the wrongs done by the Arians and requesting, among other things, the restoration of the Orthodox bishops, including Athanasius. For this, Hilary was banished to Asia Minor, where he wrote his greatest work, On the Trinity. Hilary attended several synods during his time in exile, including the synod at Seleucia (359) which saw the triumph of the homoion party and the forbidding of all discussion of the divine substance. In 360, Hilary tried unsuccessfully to secure a personal audience with Constantius, as well as to address the synod which met at Constantinople in 360. When this synod ratified the decisions of Ariminum and Seleucia, Hilary responded with the bitter In Constantium, which attacked the Emperor Constantius as Antichrist and persecutor of orthodox Christians. Hilary's urgent and repeated requests for public debates with his opponents, especially with Ursacius and Valens, proved at last so inconvenient that he was sent back to his diocese, which he appears to have reached about 361, within a very short time of the accession of Emperor Julian. Saint Hilary returned to his see nearly four years later in 361, where Saint Martin sought him out again. It was this time that Saint Hilary blessed Martin to found a monastery near Poitiers, where Martin remained until being consecrated Bishop of Tours in 371. Hilary spent most of the first two or three years after his exile trying to persuade the local clergy that the homoion confession was merely a cover for traditional Arian subordinationism. Thus, a number of synods in Gaul condemned the creed promulgated at the Synod of Ariminium (359). 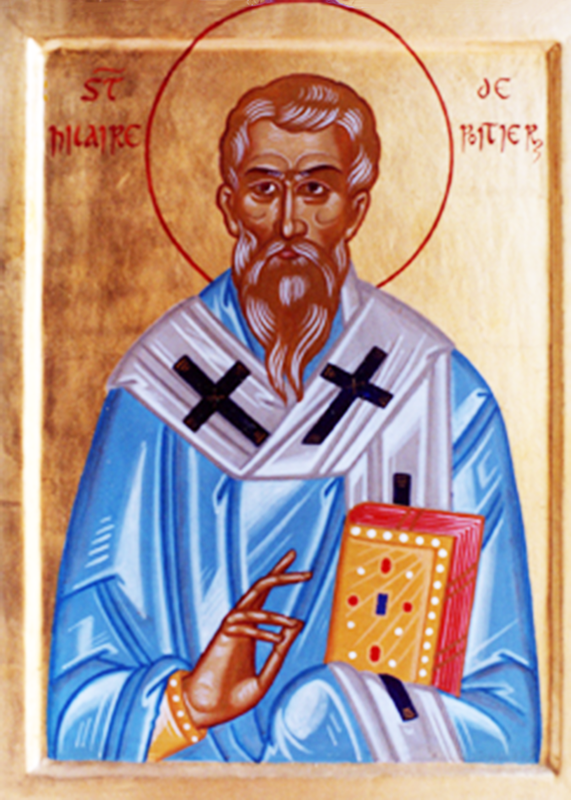 In his last years, Saint Hilary, strove for the deposition of Auxentius, the Arian Bishop of Milan, but by affecting an Orthodox confession Auxentius retained his see. Saint Hilary reposed in peace about the year 368. Auxentius died in 374 and was succeeded by Saint Ambrose, who continued Saint Hilary's battle against Arianism. "Hilary, a bishop of Poitiers in Aquitania, was a member of the party of Saturninus bishop of Arles. Banished into Phrygia by the Synod of Beziérs he composed twelve books Against the Arians and another book On Synods written to the Gallican bishops, and Commentaries on the Psalms that is on the first and second, from the fifty-first to the sixty-second, and from the one hundred and eighteenth to the end of the book. In this work he imitated Origen, but added also some original matter. There is a little book of his To Constantius which he presented to the emperor while he was living in Constantinople, and another On Constantius which he wrote after his death and a book Against Valens and Ursacius, containing a history of the Ariminian and Selucian Synods and To Sallust the prefect or Against Dioscurus, also a book of hymns and mysteries, a commentary On Matthew and treatises On Job, which he translated freely from the Greek of Origen, and another elegant little work Against Auxentius and Epistles to different persons. They say he has written On the Song of Songs but this work is not known to us. He died at Poitiers during the reign of Valentinianus and Valens." His holy relics still rest in the cathedral bearing his name at Poitiers in France. Enduring exile for the faith delivered to the Church of Christ, thou didst withstand the deceit of the Arians, O holy Hierarch Hilary. By thy prayers and thy teachings, O defender of Orthodoxy and right belief, convert the Western lands and entreat Christ for us, who honour thee.